Background: Helicobacter pylori (H. pylori) is linked to the development of the majority of peptic ulcers and some types of gastric cancers, and its antibiotic resistance is currently found worldwide. Objective: This study is aimed at evaluating the anti-H. pylori activity of Korean acacia honey and isolating the related active components using organic solvents. Material and Methods: The crude acacia honey was extracted with n-hexane, dichloromethane, ethyl acetate (EtOAc), and n-butanol. The EtOAc extract was subjected to octadecyl-silica chromatography. The extracts and fractions were then examined for anti-H. pylori activity using the agar well diffusion method. The antimicrobial activity of abscisic acid against H. pylori was investigated by determining the minimum inhibitory concentrations (MICs), minimum bactericidal concentrations (MBCs), and by performing a time-kill assay. Results: Abscisic acid related to the botanical origins of acacia honey from Korea has been analyzed using ultra-performance liquid chromatography. The MICs and MBCs of abscisic acid were 2.7 ± 1.3 and 6.9 ± 1.9 μg/mL, respectively. 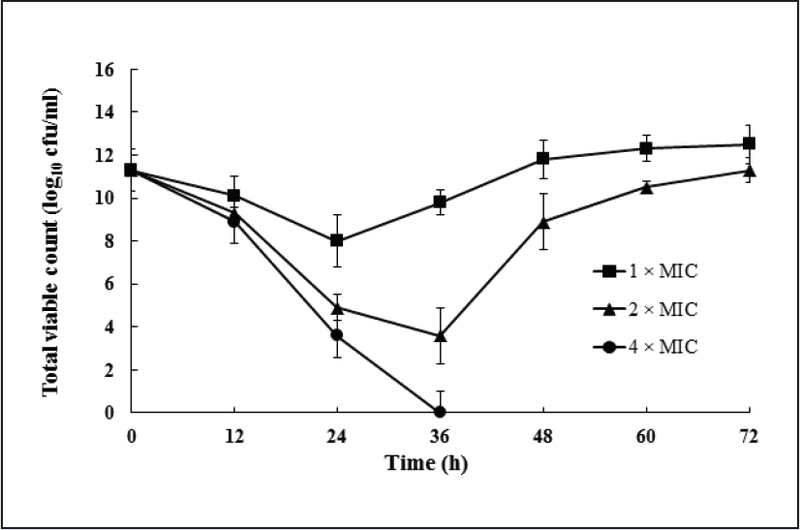 The bactericidal activity of abscisic acid (at 10.8 μg/mL corresponding to 4 × MIC) killed the organism within 36–72 h. These results suggest that abscisic acid isolated from Korean acacia honey has antibacterial activity against H. pylori. Conclusion: Abscisic acid isolated from Korean acacia honey can be therapeutic and may be further exploited as a potential lead candidate for the development of treatments for H. pylori-induced infections. Abbreviations used: MeOH: Methanol; EtOAc: Ethyl acetate; TSB: Trypticase soy broth; MIC: Minimum inhibitory concentration; MBC: Minimum bactericidal concentration; CFU: Colony-forming units; UPLC: Ultra-performance liquid chromatography; DAD: Diode array detector; UV: Ultraviolet; ODS: Octadecyl-silica; MS: Mass spectrometry; SE: Standard error. Abscisic acid exhibited antibacterial activity against H. pylori. Helicobacter pylori (H. pylori) is considered as the causative agent of chronic gastritis, peptic ulceration, and gastric cancer., Approximately 50 and 59.6% of the world and Korean populations, respectively, have been reported to be infected with H. pylori., This Gram-negative, curved-rod bacterium colonizes the gastric epithelial surface and withstands the stomach's hostile acidic environment because of its microaerophilic growth capacity. Treatment for the control of H. pylori infection has continued to advance from the standard triple therapy using a combination of agents such as antibiotics, bismuth subsalicylate, proton pump inhibitors, and H2-blockers. However, eradication of the organism is incomplete and this treatment is not entirely curative and often associated with undesirable side effects. Therefore, nonantibiotic-based agents such as natural compounds, which are effective and free from side effects, may be beneficial for the control of H. pylori. Floral honey, a natural sweetener collected by bees from nectar, is a complex mixture of sucrose, fructose, glucose, water, proteins, amino acids, vitamins, minerals, and organic acids and widely used in numerous applications such as supplementary diets, tonics, and cosmetics., It has also been reported to have various biologic activities such as antioxidant, anti-inflammatory, and antibacterial. Of course, the components of honey can vary depending on floral and geographical origins as well as seasonal and environmental climatic conditions., It is generally known that honey has osmotic effects, is acidic, and contains hydrogen peroxide and plant-derived substances. Several kinds of floral honey exhibit additional antimicrobial activity, which has been attributed to various components including methylglyoxal, bee defensin-1, and other floral-derived phenolic compounds., The aim of the present study was to evaluate the anti-H. pylori activity of acacia honey from Korea and isolate the active components mediating the antibacterial effect of the acacia honey. The study was performed in 2014 and the honey samples used were the acacia (Robinia pseudoacacia L.) from Korea. This was purchased from 10 areas of the Korea Apicultural Agriculture Cooperative (Seoul, Korea) and certified by the cooperative and the Korea Food and Drug Administration. The honey samples were stored in the dark and at 4°C before use. The proton (1H-600 MHz) and carbon 13 (13C-150 MHz) nuclear magnetic resonance spectra were obtained using a JNM-ECA-600 spectrometer (JEOL, Japan). The chemical shifts were expressed in parts per million (ppm) relative to tetra-methylsilane as an internal standard and coupling constants (J) were expressed in Hertz (Hz). The mass spectrometry (MS) was performed using a liquid chromatography MS–ion trap-time-of-flight (LCMS–IT–TOF) system (Shimadzu, Japan). The column chromatography was performed using silica gel (Kieselgel 60, 40–63 μm, Merck, Germany), octadecyl-silica (ODS)-A resins (75-μm, YMC, Japan) and thin-layer chromatography (Merck, Germany). All other chemicals and reagents were analytical grade. The crude acacia honey (10 kg) was extracted thrice with methanol (MeOH) with stirring and the solvent was evaporated in vacuo to obtain the MeOH residue (5.4 kg). The residue was suspended in water (H2O) and partitioned with n-hexane (3.5 g), dichloromethane (7.0 g), ethyl acetate (EtOAc, 9.0 g), and n-butanol (2.5 kg). The EtOAc extract was further subjected to ODS column chromatography (5 cm × 80 cm) using a gradient of MeOH-H2O (1:4-4:1) to yield eight fractions (Fr. A1–A8). Fr. A5 was chromatographed on a silica gel column (1.5 cm × 50 cm) with CH2Cl2:MeOH:H2O (90:15:10) to yield three subfractions (Fr. 51-54). All fractions were monitored by susceptibility testing against H. pylori. Compound I (11mg) was separated using a recrystallization method from Fr. 54, and was analyzed by Waters (MN, USA) ultra-performance liquid chromatography (UPLC) I class system equipped with a BEH C18 (2.0 × 50 mm, 1.7 μm) column. The diode array detector (DAD) wavelength was set at 260 nm based on the UV absorption of compound I. This had the following characteristics. 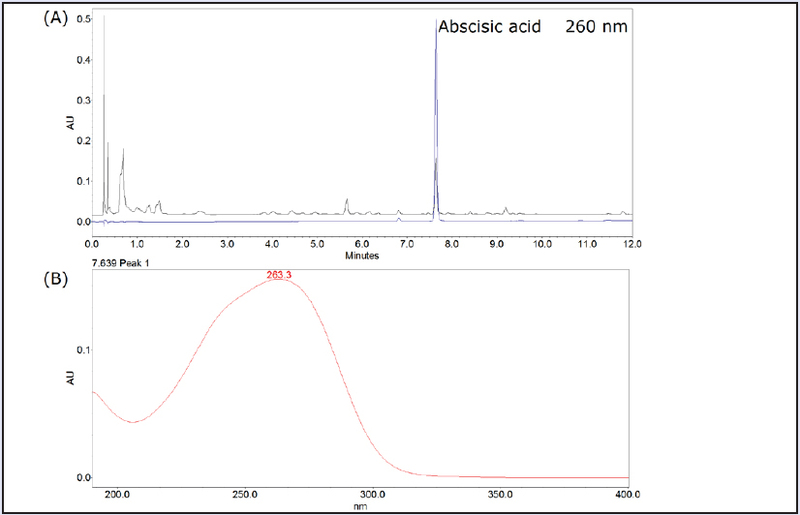 Compound I: white powder; ESI-MS m/z 264.1 [M+H]+;1H-NMR (600 MHz, DMSO-d6): δ 7.73 (1H, d, J = 15.8 Hz, H-4), 6.22 (1H, d, J = 15.8 Hz, H-5), 5.81 (1H, s, H-3'), 5.67 (1H, s, H-2), 2.53 (1H, d, J = 16.5 Hz, H-5'b), 2.11 (1H, d, J = 16.5 Hz, H-5'a), 1.97 (3 H, s, H-6), 1.82 (3 H, s, H-7'), 0.96 (3 H, s, H-9'), 0.92 (3 H, s, H-8');13C-NMR (150 MHz, DMSO-d6): δ 197.2 (C-4'), 167.0 (C-1), 163.1 (C-2') 148.8 (C-3), 137.1 (C-5), 127.3 (C-4), 125.9 (C-2), 118.7 (C-3'), 78.3 (C-1'), 49.3 (C-5'), 41.2 (C-6'), 24.1 (C-9'), 23.2 (C-8'), 20.8 (C-6), 18.8 (C-7'). The anti-H. pylori assay was performed using the American Type Culture Collection (ATCC) strain ATCC 43526 from the Korean Culture Center of Microorganisms (Seoul, Korea). The H. pylori was cultured for 3 days at 37°C in trypticase soy broth (TSB, BBL, USA) containing 5% horse serum (MB cell, Korea) in an anaerobe container system (BD, USA). An agar well diffusion assay was performed according to the method of Dastouri et al. to assess the antimicrobial activity of the acacia honey fractions. Briefly, cultured H. pylori (100 μL, OD540 = 0.5) was added to warm nutrient agar, which was then poured into plates and allowed to set for at least 6 h. Wells were cut into the agar plates using a sterile cork borer in a regular grid pattern. The honey samples were tested for antibacterial activity at a concentration of 25%. After incubation for 3 days, digital caliper used to measure the diameter of the inhibition halo zone around the wells. The minimum inhibitory concentration (MIC) of abscisic acid was determined using the broth microdilution method in 96-well microtiter plates. The abscisic acid was dissolved in distilled water and then filtered through a membrane filter (0.2 μm pore size, Millipore, Billerica, MA, USA). Then, the H. pylori suspension (1 × 106 colony-forming units [CFUs]/mL) was incubated with twofold serial dilutions of abscisic acid prepared in TSB containing 5% horse serum under anaerobic conditions for 24 h. The MIC was determined as the lowest concentration of abscisic acid that inhibited the visible growth of the test organism (optically clear). The positive control used was amoxicillin (Sigma-Aldrich, St. Louis, MO, USA). The minimum bactericidal concentration (MBC) value was determined as the lowest concentration of abscisic acid required to achieve a 99.9% reduction in the viable H. pylori cell population (NCCLS, 2008). To determine the MBC values, an aliquot (0.1 mL) of each MIC mixture that showed no growth was inoculated onto trypticase soy agar plates and incubated at 37°C for 48 h. No trailing was observed. The time-kill assays were performed using previously described standard Clinical and Laboratory Standards Institute (CLSI) guidelines. Briefly, bacterial suspensions were diluted with appropriate broth media to 1.8 × 108 CFUs/mL of H. pylori, pre-incubated at 37°C and the samples were co-incubated with abscisic acid adjusted to 1.0% in TSB to a final concentration of the MIC, 2 × MIC, and 4 × MIC. Then, 100 μL aliquots of the culture collected before (0 h, positive control) and 18 h after the addition of abscisic acid were used to estimate the CFUs on the appropriate agar plates with adequate dilutions using buffered saline supplemented with 0.01% gelatin. Three plates were used for each sample, the CFU estimation was repeated separately, and the plates were later incubated at 37°C for 72 h.
Data are presented as mean ± standard error (SE). Experimental results were statistically analyzed using the Duncan's t-tests (SAS Enterprise Guide, SAS Institute Inc., Cary, NC, USA). 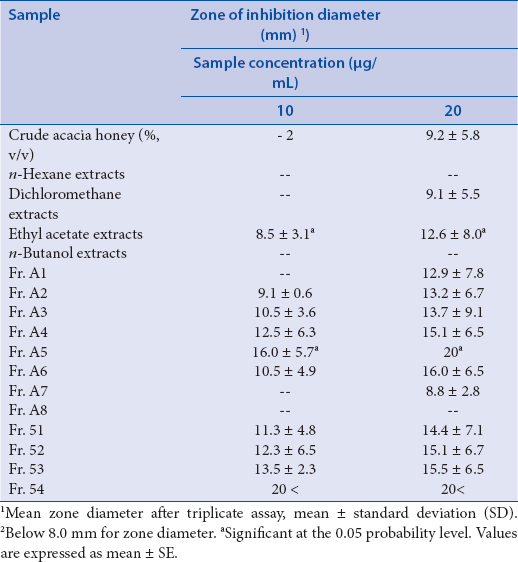 The crude acacia honey showed detectable antibacterial activity against the H. pylori strains with inhibition zone diameters of 9.2 ± 5.8 mm at a concentration of 20% (v/v) [Table 1]. All the solvent extracts and fractions were evaluated for antibacterial activity against H. pylori [Table 1]. The highest inhibitory activity was demonstrated by the EtOAc extract, which exhibited an inhibition zone with a diameter of 8.5 ± 3.1 mm (10 μg/mL), while hexane, dichloromethane, and butanol extracts did not exhibit any activity at this concentration. The EtOAc extract yielded eight fractions, and then four subfractions were subsequently obtained chromatographically. Among these fractions, Fr. 54 showed the most potent antibacterial effect against H. pylori [Table 1]. Compound I was isolated from Fr. 54 and its structure was identified based on spectroscopical data, chemical evidence, and comparisons with previous reports [Figure 1]. Its structure was elucidated as abscisic acid. Based on the absorption maxima in the UV spectra with three-dimensional UPLC-DAD detection, the monitoring wavelength was detected at 260 nm [[Figure 2]A. The active compound I was identified by comparing the UPLC retention times and UV absorption of its target peaks in the EtOAc extract of the acacia honey with the standard compound. The UV spectrum is shown in [Figure 2]B. The mean MICs of abscisic acid and amoxicillin (positive control) were 2.7 ± 1.3 and 10.9 ± 5.5 μg/mL, respectively [Table 2]. Therefore, the abscisic acid isolated from Korean acacia honey was approximately fourfold more effective than amoxicillin in inhibiting H. pylori in the in vitro tests. In addition, the mean MBC for abscisic acid (6.9 ± 1.9 μg/mL) was lower than that of amoxicillin (39 ± 7.5 μg/mL), suggesting that abscisic acid showed a more effective inhibition than amoxicillin did [Table 2]. The time-kill curves of abscisic acid against H. pylori are illustrated in [Figure 3]. The abscisic acid showed a concentration-dependent CFU reduction. All the concentrations tested exhibited antibacterial activity against H. pylori over time, and most concentrations reduced the bacterial count by least 8 log units after 24 h. At a concentration of 10.8 μg/mL (corresponding to 4 × MIC), 100% of the bacterial cells were killed within 36-72 h. However, there was bacterial cell growth at concentrations that were equivalent to 1× and 2 × MIC within 36-72 and 48-72 h, respectively. In the preliminary screening, Korean acacia honey showed antibacterial activity against H. pylori at concentration as low as 10% (v/v). There are numerous reports on the antibacterial activity of natural honey, which is attributed to its acidity, osmolarity, hydrogen peroxide content, and phytochemical components (Mannina, 2015). Honey is known to contain phytochemicals including peroxides, amylase, fatty acids, phenols, ascorbic acid, flavonoids, terpenes, and benzoic acid. Honey is of plant origin and can be extracted with organic solvents. The active component content is often low or diluted in honey but concentrated following extraction, and the resulting extracts show higher activities. These components could act as natural antibacterial agents or antioxidants and have been reported to inhibit the growth of Streptococcus, Bacteroides, Staphylococcus, Prevotella, and various other enteropathogens. Furthermore, the observation that honey produced in New Zealand and Saudi Arabia inhibit the growth of H. pylori, prompted our investigation of other honey varieties for potential antimicrobial effect. While the mechanism by which honey induces microbial death is considered to involve multiple pathways, its hydrogen peroxide content appears to be an important component mediating its antimicrobial effect. In addition, other research studies have found that the non-peroxide components of honey are extractable by organic solvents. In this study, organic solvents of varying polarities namely n-hexane, EtOAc, dichloromethane, and n-butanol were used to extract the anti-H. pylori-active principles in honey. Among the solvent fractions, those obtained from the EtOAc extract showed the highest activity against H. pylori, and abscisic acid was isolated from the most soluble EtOAc fraction. In this study, abscisic acid was isolated and identified in Korean acacia honey for the first time. Abscisic acid has been found in numerous varieties of honey including the Australian blue gum, Leatherwood, and acacia honeys from France, Germany, and Italy, and was revealed to have the potent anti-H. pylori effect. The positive control, amoxicillin, used in this study showed an anti-H. pylori effect with an MIC of 10.9 ± 5.5 μg/mL and MBC of 39 ± 7.5 μg/mL, whereas abscisic acid exhibited MIC and MBC values of 2.7 ± 1.3 and 6.9 ± 1.9 μg/mL, respectively. The bactericidal activity of the abscisic acid was determined using viability studies and was the highest at 4× MIC concentration at 30–72 h. However, there was a recurrent growth of bacterial cells from 48 to 72 h after the cells were killed at 36 h at the lowest concentration (2× MIC). This study demonstrated that the antibacterial activity of abscisic acid isolated from Korean acacia honey against H. pylori is evident at concentrations that can be achieved in the stomach following a reasonable oral dose. Furthermore, numerous people have ingested acacia honey, a common and popular floral-based food in Korea, in large quantities for a long time without any obvious adverse effects. Therefore, it is relatively safe. However, clinical trials are necessary to determine the efficacy and complete safety profile of Korean acacia honey for the treatment of dyspepsia, which is known to involve H. pylori. This work was supported by the Cooperative Research Program for Agriculture Science and Technology Development, Rural Development Administration, the Republic of Korea under Project Grant No. PJ01083701. Karttunen R, Andersson G, Poikonen K, Kosunen TU, Karttunen T, Juutinen K, et al Helicobacter pylori induces lymphocyte activation in peripheral blood cultures. Clin Exp Immunol 1990;82:485-8. Parsonnet J. Helicobacter pylori: the size of the problem. Gut 1998;43:S6-9. Ayala G, Escobedo-Hinojosa WI, de la Cruz-Herrera CF, Romero I. Exploring alternative treatments for Helicobacter pylori infection. World J Gastroenterol 2014;20:1450-69. doi:10.3748/wjg.v20.i6.1450. Kim N, Kim JJ, Choe YH, Kim HS, Kim JI, Chung IS. Diagnosis and treatment guidelines for Helicobacter pylori infection in Korea. World J Gastroenterol 2009;54:269-78. Goodwin CS, Armstrong JA. Microbiological aspects of Helicobacter pylori (Campylobacter pylori). Eur J Clin Microbiol Infect Dis 1990;9:1-13. Hentschel E, Brandstatter G, Fragosics B, Hirschl AM, Nemec H, Schutze K, et al. Effect of ranitidine and amoxicillin plus metronidazole on the eradication of Helicobacter pylori and the recurrence of duodenal ulcer. N Engl J Med 1993;328:308-12. Masuda H, Hiyama T, Yoshihara M, Tanaka S, Haruma K, Chayama K. Characteristics and trends of clarithromycin-resistant Helicobacter pylori isolates in Japan over a decade. Pathobiology 2004;71:159-63. Alvarez-Suarez JM, Tulipani S, Romandini S, Bertoli E, Battino M. Contribution of honey in nutrition and human health: a review. Med J Nutrition Metab 2010;3:15-23. Burlando B, Cornara L. Honey in dermatology and skin care: a review. 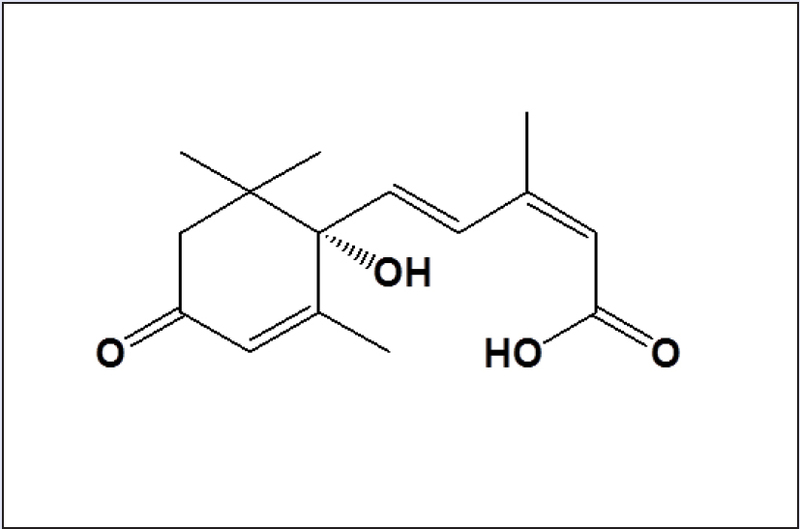 J Cosmet Dermatol 2013;12:306-13. Anklam E. A review of the analytical methods to determine the geographical and botanical origin of honey. Food Chem 1998;63:549-62. Jasicka-Misiak I, Poliwoda A, Dereń M, Kafarski P. Phenolic compounds and abscisic acid as potential markers for the floral origin of two Polish unifloral honeys. Food Chem 2012;131:1149-56. Kwakman PHS, Zaat SAJ. Antibacterial components of honey. IUBMB Life 2012;64:48-55. Marvric E, Wittmann S, Barth G, Henie T. Identification and quantification of methylglyoxal as the dominant antibacterial constituent of Manuka (Leptospermum scoparium) honeys from New Zealand. Mol Nutr Food Res 2008;52:483-9. Dastouri MR, Fakhimzadeh K, Shayeg J, Dolgari-sharaf J, Valilou MR, Maherisis N. Evaluating antibacterial activity of the Iranian honey through MIC method on some dermal and intestinal pathogenic bacteria. J Anim Vet Adv 2008;7:409-12. Mates SM, Patel L, Kaback HR, Miller MH. Membrane potential in anaerobically growing Staphylococcus aureus and its relationship to gentamicin uptake. Antimicrob Agents Chemother 1983;23:526-30. National Committee for Clinical Laboratory Standards (NCCLS)Performance standards for antimicrobial susceptibility testing. 18th Informational Supplement. NCCLS Document M100-S18. Wayne, PA: NCCLS. 2008. Mannina L, Sobolev AP, Lorenzo AD, Vista S. Tenore GC, Daglia M. Chemical composition of different botanical origin honeys produced by Sicilian black honeybees (Apis mellifera ssp sicula). J Agric Food Chem 2015;63:5864-74. Heering H, Usleber E, Dietrich R, Märtlbauer E. Immunochemical screening for antimicrobial drug residues in commercial honey. Analyst 1998;123:2759-62. Yao LH, Jiang YM, Singanusong R, Datta N, Raymont K. Phenolic acids and abscisic acid in Australian Eucalyptus honeys and their potential for floral authentication. Food Chem 2004;86:169-77. Osato MS, Reddy SG, Graham DY. Osmotic effect of honey on growth and viability of Helicobacter pylori. Dig Dis Sci 1999;44:462-4. Somal NA, Coley KE, Molan PC, Hancock BM. Susceptibility of Helicobacter pylori to the antibacterial activity of manuka honey. J R Soc Med 1994;87:9-12. Molan PC, Russell KM. Non-peroxide antibacterial activity in some New Zealand honeys. J Apic Res 1988;27:62-7.